The content below is from the site's 2015-2016 archived pages. English Premier Schedule for 2015- 2016 season was officially unveiled on June 17, 2015. This edition of Barclay's premier league is expected to begin from August 8, 2015 that means all Fantasy Premier league managers can begin working on their fantasy teams soon. After looking into the schedules we have done an analysis for first 4 weeks of English Premier League. I hope our analysis will help you selecting the best and profitable team for Barclays Premier league fantasy football season 2015-16. We have done our analysis based on the first few matches of each team. Sunderland, Southampton and Leicester City will be have some of their easiest matches in EPL 2015/16 on the first weeks. These three teams will be playing their first 5 matches against few newly promoted as well as other low ranking premier league teams. Southampton looks to be the best bet among the three as they have the better team compared to the other three. Southampton will be playing their opening match in EPL 2015/16 against New Castle United. In the third and fourth game weeks they will be playing their league matches against the newly promoted Watford and Norwich. Southampton defense will be the best bet to invest for Fantasy Premier League 2015/2016. Last year Southampton started the season pretty well with few clean sheets. Leicester City is one another team on our list for the selection of fantasy premier league 2015/2016 team members, Leicester city will be playing their first match against Sunderland, who in the last edition narrowly escaped from relegation. Jamie Vardy will be one of their best player who was recently called up to the English Squad. I suggest you to include Jamie Vardy on your EPL fantasy premier league team. If you are a guy who want to add players from the top six teams of English Premier league, it would be difficult because almost all top teams has got difficult start for this edition. Manchester United would be the safest and the best bet to invest as they are having the easiest start among the top six premier league teams. Manchester United will be playing their opening match against Spurs, it would cause some trouble initially, but the next two league matches will be against New Castle and Aston Villa. 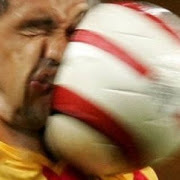 Playing against low performing teams would certainly increase their morale and form. Biggest test for Manchester United will be against Liverpool. I hope you all loved reading the article, please your views under the comment section. We can make this article super active so that every one reading this article would find it helpful for selecting their best Fantasy team for Barclay's premier league fantasy football. Subscribe us for getting latest tips and updates on Barclay's fantasy premier league 2015/2016. I was dreaming of my EPL Fantasy Team when my wife gently reminded me that I was suppose to be looking for a local Baltimore moving company. We were leaving the area to head for a new job and new home on the west coast. My job was to get a list of some possible moving companies before dinner. I did a search for long distance movers in the Baltimore area and found a likely candidate, Von Paris Moving & Storage. Not only were they local movers, but they also did long distance and even international moves for both residential and corporate customers. They had been named the official Mover of the Baltimore Orioles, the Baltimore Ravens and the Baltimore Symphony Orchestra. Very Cool. And third, fourth and fifth generation family members were now running the business. Here were Baltimore movers with 100+ years experience and they were local. My wife was going to love them. And now that I have done my search for a moving company, I can now organize my EPL Fantasy Team. I have to be extra careful this year. Well this was a pretty productive Saturday afternoon, if I say so myself. If you are quite new to Barclay's Fantasy premier league, I would suggest you to check out my writings on this blog. After an exciting 2014/2015 Barclay's premier league our eyes and attention are now turned to the fast approaching 2015-2016 season. It's high time to build your epl fantasy team, so there are certain things to keep in mind before building a fantasy premier league team, we will be discussing some the do's and don'ts in building an epl fantasy team. What do you mean by a Fantasy Premier League ? Fantasy football is a virtual game in which you act in the role of a club manager, during the start of the game you will be given a certain amount of money for buying your epl fantasy team. One have to use this amount wisely, if you aren't doing it so you will end up bankrupt ( virtually ). Points in Fantasy premier league is earned or deducted according to the performance of your team members in reality. Basically points are given as follows. Following things are to be kept in your mind before selecting an EPL Fantasy team. Formation in which your team plays is one of the major part while selecting defenders, midfielders and strikers. Always keep in mind of your team formation while selecting team members. Initially you will be given £100 m. You have to spend this amount wisely on defenders, midfielders and strikers. According to our available records attackers and midfielders have scored more points than defenders. While selecting defenders you have to include best defenders in your team, by best i mean the defenders who have conceded less amount of goals. You will be losing points if your defenders concede goals, so always try to select the best defenders. We have shortlisted some of the best defenders according to the no of clean sheets. One of the main thing to keep in your mind while selecting midfielders for your fantasy team is always try to buy players who has got fair amount of assists and goals. Keep an eye on set piece takers and play makers, We have short listed some of the best midfielders for building your epl fantasy team. These are some of the best midfielders available, I won't suggest you to have all of them in one team, so wisely select one or two midfielders from the above list. Strikers and Midfielders are the pillars of your fantasy premier league team, they will be fetching you the most no of points. 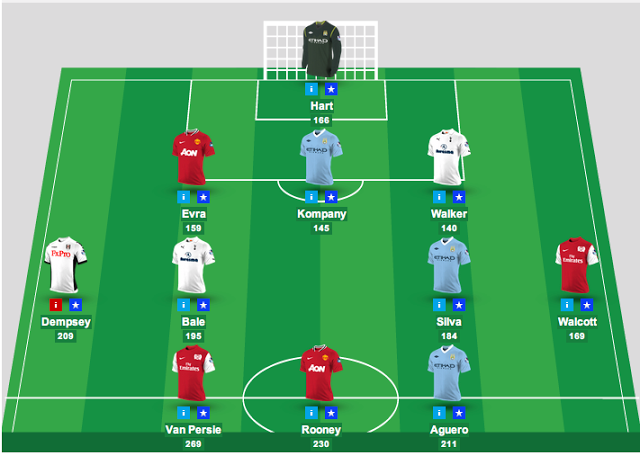 One should be quite careful in selecting strikers and midfielders for fantasy premier league team. When selecting strikers and midfielders you should look for players who score goals. Suarez was the top scorer for the last season of barclays premier league. We here has shortlisted few strikers according to the no of goals scored by them in the last season. Always select goal keepers with good no of clean sheets and with less no of conceded goals also keep an eye on save rate. Goal keepers are awarded a point for every 3 saves in a match. Here is our shortlisted goal keepers for Barclays fantasy premier league. Only 11 players are allowed to play, you also add some reserve players who can fetch you some valuable points, having good reserve bench makes the difference in most of the fantasy league. Keep an eye on premier league fixtures, select the players who get the chance to play most no of matches in the first few game weeks. Try selecting players who has got "easier" matches. We have already done a cross analysis of EPL Fantasy Premier League 2015/2016, please do check it out. Always make use of wild card early in the season for getting a well balanced fantasy team, wild card enables you to do transfers without any deduction in points. Captain will be scoring double points according to their performance during the game week. Choosing the best captain for your side will make a big difference. Captain will be the most expensive player on your team. I hope you loved reading our fantasy premier league tips, share your views on BPL fantasy league and team selection. It will be quite good to have a healthy communication under the comment section. Subscribe us for getting latest epl news and fantasy premier league tips. English Premier League a.k.a Barclay's premier league will be back after a wait of few months. In here today we will be listing out the key dates to remember in this edition of EPL. Along with EPL key dates will be also listing out some of the frequently asked questions on EPL fantasy League 2015. Let's now check out EPL 2015-2016 Pre Season Schedule with dates. EPL 2015 - 16 edition will start on 8th August 2015, so you can expect epl 2015-16 fantasy league to start a week before the start of English Premier League. In the next article we would be sharing the complete schedule of EPL 2015. Vertical Jumping Training - Vert Shock Review, Scam or Legit? Review Vertical Jumping Training - Vert Shock Review, Scam or Legit ? 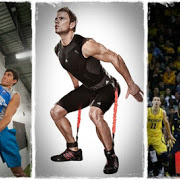 One can find a lot of Vertical Jump training system, but it is always difficult to find the best and the right one. Today in here we will be showing the best vertical jump training system, the system is named as Vert Shock. I myself has bought this cool contraption. 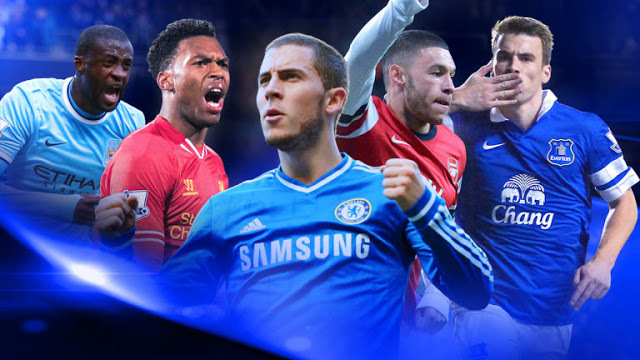 Unlike all times Fantasy Premier League 2015/16 edition is back with few new features. This so-called new feature is named as " CHIPS ". CHIP is nothing but a one-time boost which you can apply to your fantasy team. In the beginning of a new season, check out whether you can gain an advantage. Tottenham was having an inconsistent season last year even though they finished fifth in the league. They missed their spot at Champions league 2015 by whisker, the manager and club authorities are looking forward for a much better season this year. English Premier League 2015/16 is fast approaching so that everyone is busy preparing their fantasy premier league team. 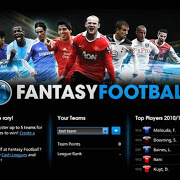 Fantasy Premier League is one of the most popular fantasy football leagues, it is estimated that around 4 million people are playing at any given time.